Antioxidants, such as metabolite glutathione, rid the body of harmful free radicals. Antioxidants are chemical compounds found naturally in organic material that serve to rid the body of harmful "free radicals," which are molecules without a stable electron count. These radicals may damage cell walls, DNA, or proteins. A wide variety of antioxidants exist, each suited to neutralize specific free radicals in chemical reactions. Although several antioxidants are found naturally in the body through metabolic production, other essential antioxidants are found in foods such as berries, coffee, and fruits. Free radicals attack nearby DNA, enzymes, cell walls, or chemicals to fill their electron shells. Antioxidants encompass a wide variety of particles that rid the body of harmful particles, known as free radicals. 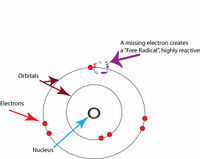 Tree radicals are atoms that have unpaired electrons, making them react readily with other elements and substances in the body. This causes damage in internal body tissue. Cells constantly participate in chemical processes and undergo environmental stress, which may break stable bonds between two biological particles. As an electron is removed from the bond, the particle with the unpaired electron becomes a free radical, which will attempt to bond its electron by breaking the bonds of other healthy particles nearby, such as cell walls, DNA, and enzymes. This quickly creates a chain reaction of free radical formation as two free radicals are created for every one free radical attack. Antioxidants donate electrons to these free radicals, neutralizing their harmful properties, without becoming free radicals themselves. In addition, trace metals found in the body often interfere with the bonds of intercellular compounds. For example, H2O2 is reduced by Fe2 into damaging OH- hydroxyl free radicals. These radicals can be neutralized by the antioxidant a-tocopherol. Many common fruits and vegetables contain antioxidants. Antioxidants are found naturally in the body as metabolites and specific anti-oxidation enzymes that exist to keep the free radical count below harmful levels. These catalysts either restrain the formation of free radicals in the first place or neutralize them before they damage other chemicals in the cell. The body naturally produces several types of unstable oxygen "species" and free radicals, which may be byproducts of metabolic functions or exist to initiate a metabolic process, such as in the case of redox signaling. These reactive chemicals must remain at low levels in order to avoid heavy oxidative stress on the tissues, proteins, and DNA. Oxidative stress is a constant presence in biological organisms as they breathe oxygen, process oxygen in cellular respiration, and break apart oxygen into ions during metabolic processes. Without sufficient levels of antioxidants to combat these forms of oxygen and free radicals, the chain reaction of free radical formation may damage DNA and cause mutations, render a protein useless, or compromise a cell wall. Over time, these negative effects have been theorized to contribute to the aging process itself and cause cancer. Antioxidants can also be found in several common fruits, vegetables, nuts, and grasses. Notable examples include the acai berry, blueberries, dark chocolate, pineapples, broccoli, and cherries. These foods contain high levels of antioxidants from their initial development on a plant. A numerical value is assigned to many high-antioxidant foods to convey the concentration of antioxidants compared to other foods. This value, called the Oxygen radical absorbance capacity (ORAC), is roughly 6552 in blueberries, 40,200 in chocolate, and 267,536 in ground cinnamon. It is commonly believed that the more antioxidants a food contains, the greater defense against free radicals it has, possibly lowering one's chance of cancer, dramatic aging, muscle degeneration, and brain tumors. 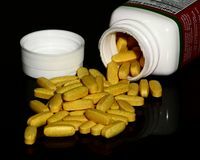 Many people take antioxidant supplements in the form of a pill. Antioxidants are widely publicized in popular nutrition as being healthy for the body. This has become so prevalent in society that several companies have sold antioxidant supplements to the public. Foods rich in antioxidants, such as the acai berry, are also popularized. One of the most common antioxidant supplements is Proanthocyanidin (OPC), which is considered the most powerful and active antioxidant. Many skin care companies draw attention to an antioxidant's benefits on collagen, which primarily comprises blood vessels. In 1992, a group of scientists provided antioxidant supplements to 96 adult men and women, using placebo supplements as a control group. After one year, those taking antioxidant supplements exhibited a dramatic advantage over the control group in immune function and required significantly less time on antibiotics against infections. However, other studies show little benefit from antioxidant supplements. One study involving 35,000 men and 38,000 women spread out over 20 years showed little difference in the health and risk of disease than those who did not take any antioxidant supplements. In fact, the study showed a slightly higher risk of prostate cancer in men. Additionally, some studies show little significant improvement with macular degeneration of the eyes, a commonly cited benefit of antioxidant supplements. Alpha-tocopherol is a lipophilic antioxidant, commonly referred to as Vitamin E.
Antioxidants can be broken into two primary categories, hydrophilic and lipophilic. Hydrophilic antioxidants are soluble in water and commonly act in blood plasma and the internal components of cells. Lipophilic antioxidants can dissolve in lipids are are commonly active in cell membranes. The body obtains several varieties of antioxidants through both metabolic production and diet, but specific antioxidants may be concentrated to specific locations in the body. For example, glutathione is found primarily within the cytosol of cells while uric acid seems distributed evenly throughout a variety of locations. Hydrophilic: The most common hydrophilic antioxidants are uric acid, vitamin C, and glutathione. Uric acid is the most common antioxidant in the body and contributes to the de-oxidation of peroxides and hypochlorous acid. Uric acid is metabolized in the body from xanthine, using the enzyme xanthine oxidase. Despite uric acid's essential role in oxidant reduction, high levels of uric acid seem associated with heart disease, gout, and other diseases. Exact reasons for this effect remain in speculation; some scientists suggest that uric acid may act as both an antioxidant and an oxidant in different bodily environments. Another common hydrophilic antioxidant is ascorbic acid (vitamin C), which is a redox catalyst that humans must obtain through diet. Vitamin C is important for the neutralization of compounds such as hydrogen peroxide (H2O2), which are common contributers to oxidative stress. Lipophilic: a-tocopherol, referred to as Vitamin E, is a common lipid-soluble compound with antioxidative properties. This compound is one of the most important antioxidants in the cell membrane, stopping the chain reaction of damaging oxidation that frequently takes place in these regions. In addition, Coenzyme Q10 is a very common lipophilic compound in the body, with numerous functions beyond antioxidation. Also called ubiquinol, this vitamin-like compound has a role in the production of ATP and may be taken as a supplement to increase energy, improve heart health, and strengthen immunity. Antioxidants neutralize free radicals in the body, reducing the effects of aging and improving bodily function. ↑ Antioxidants Topic Overview WebMD. Web. Updates 14 January 2014. Author Unknown. ↑ Farnworth, Ted. How Antioxidants Work Medicinal Food News. Web. Published October 1997. ↑ 3.0 3.1 3.2 3.3 How Antioxidants Work Berkeley Wellness. Web. Updates 15 January 2014. Author Unknown. ↑ 4.0 4.1 Reilly, Colleen. Antioxidants and Skin Care Vanderbilt University. Web. Accessed 20 April 2015. ↑ Oxidative Stress Wiley Online Library. Web. Published 22 November 1996. Author Unknown. ↑ Halliwell, Barry. Reactive Species and Antioxidants US National Library of Medicine. Web. Published June 2006. ↑ 7.0 7.1 Stanton, Rosemary. Antioxidants - Their Role in Health myDr. Web. Updated 16 August 2012. ↑ 8.0 8.1 Jorgustin, Ken. Top 100 High ORAC Value Antioxidant Foods Modern Survival Blog. Web. 17 March 2015. ↑ Reason. No Benefit from Antioxidant Fight Aging. Web. Updated 17 October 2011. ↑ Oxidative Stress Wiley Online Library. Web. Published 22 November 1996. ↑ Miller, Rachel. Role of Antioxidants National Center for Biotechnology Information. Web. Published 1997. ↑ Sautin, Yuri. Uric Acid United States Library of Medicine. Web. Accessed 5 May 2015. ↑ Padayatty et al. Vitamin C as an antioxidant PubMed.gov. Web. Published February 2003. ↑ Herrera, E. and C. Barbas. Vitamin E Springer Link. Web. Published March 2001. ↑ Coenzyme Q10 Medline Plus. Web. Updated 14 February 2015. This page was last modified on 29 October 2015, at 20:01.